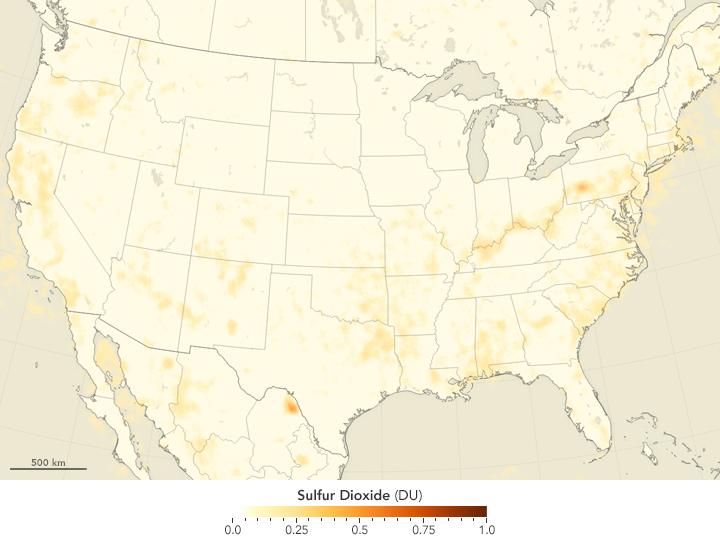 Sulfur dioxide is a pungent, toxic gas found in Earth’s atmosphere. In addition to harming human health, the gas affects the environment by reacting with water vapor to produce acid rain. Sulfur dioxide also can react in the atmosphere to form aerosol particles, which can cause outbreaks of haze and other climate problems. 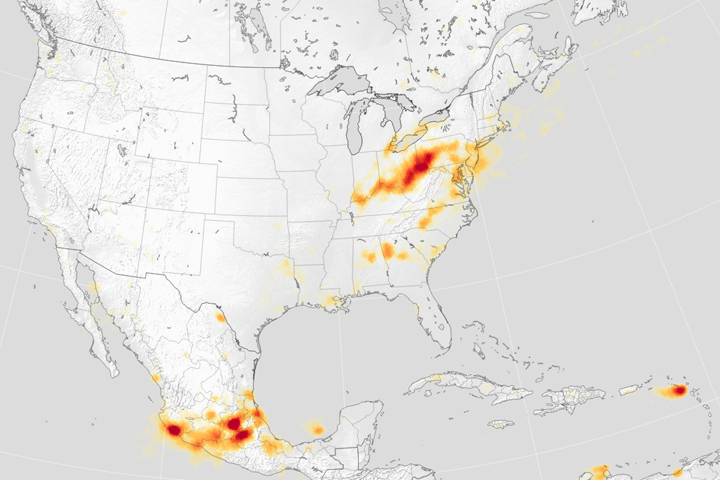 The good news for people living in the eastern United States is that levels of sulfur dioxide dropped by about 80 percent between 2005 and 2014, according to a new analysis of satellite data. 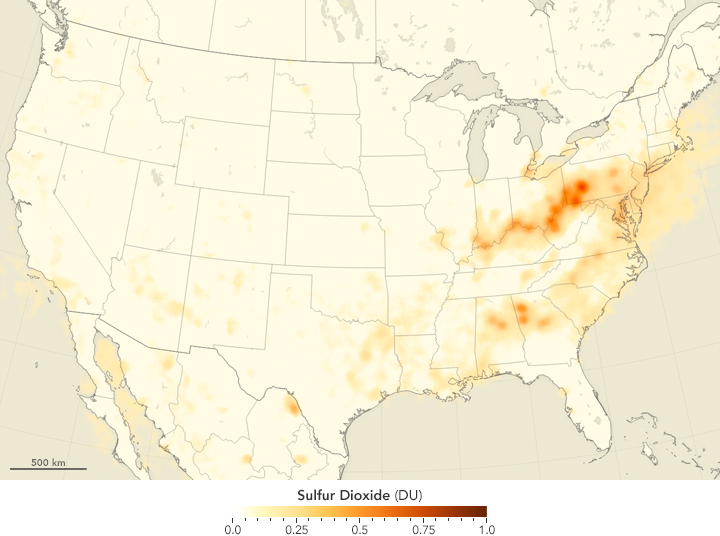 The maps above depict multi-year averages of sulfur dioxide concentrations over the eastern United States. 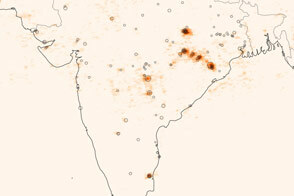 The upper map shows the average for 2005–2007 in Dobson Units (DU); the lower map shows the average for 2011–2014. 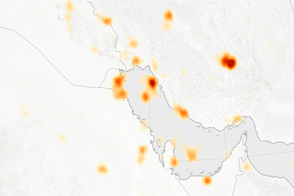 (Turn on the image comparison tool to see where levels of sulfur dioxide have declined the most.) 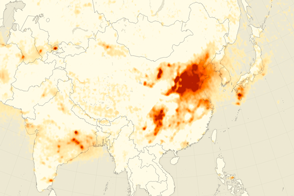 Most of the sulfur dioxide hot spots are associated with coal-fired power plants or other industrial facilities that burn coal with high sulfur content. Smelters, which are used to concentrate metals found in ore, also produce the gas. 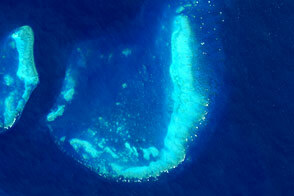 The observations were made by the Ozone Monitoring Instrument (OMI), a sensor on the Aura satellite. OMI has been monitoring sulfur dioxide and other air pollutants since 2004. The study, led by Nickolay Krotkov of NASA’s Goddard Space Flight Center, was published in Atmospheric and Chemistry Physics Discussions. The reduction in sulfur dioxide coincided with the implementation of several control strategies. Many power plants and other facilities that burn large quantities of coal have installed flue gas desulfurization devices or “scrubbers.” These technologies can reduce emissions from a given source by 50 to 90 percent. Other emissions reductions came from switching from coal with relatively high sulfur content to lower-sulfur fuel. In some other cases, coal-fired power plants were shuttered and replaced with natural gas or other cleaner energy sources such as solar or wind. Certain laws and regulations encouraged the changes. The 1990 Clean Air Act Amendment and other state regulations mandated significant reductions in sulfur dioxide emissions. Meanwhile, market-based cap-and-trade programs, such as the Acid Rain Program and the Clean Air Interstate Rule, were particularly effective, Krotkov and fellow authors noted. NASA Earth Observatory maps by Joshua Stevens and Jesse Allen, using data provided courtesy of the Aura OMI science team. OMI was developed through a partnership between NASA and the Dutch and Finnish meteorological institutes and space agencies. Caption by Adam Voiland, with information from Nickolay Krotkov. 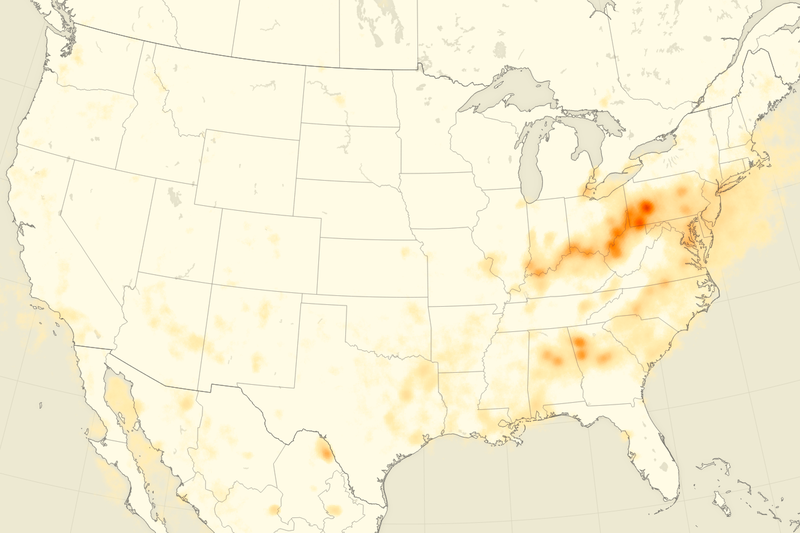 Levels of the air pollutant have dropped by about 80 percent over the eastern United States. Environmental Protection Agency 1990 Clean Air Act Amendment Summary. Accessed December 10, 2015. Environmental Protection Agency Clean Air Interstate Rule. Accessed December 10, 2015. Environmental Protection Agency Acid Rain Program. Accessed December 10, 2015. Krotkov, N.A. et al, (2015, October 1) Aura OMI observations of regional SO2 and NO2 pollution changes from 2005 to 2014. Atmospheric Chemistry Physics Discussions, 15 (19), 26555–26607. 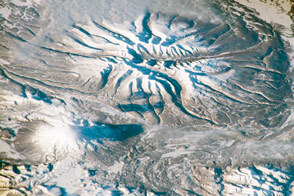 NASA (2013, December 20) NASA Satellite Confirms Sharp Decline in Pollution from U.S. Coal Power Plants. Accessed December 10, 2015.